I'm a park ranger. I love to move between parks, experience new environments, and talk with visitors. At each new park, I write down my observations to remind me what it is like to see the place for the first time. I was recently looking at notes from my first visit to Black Canyon of the Gunnison National Park. My initial thoughts read like a romance novel. “This place is breathtaking, not just pretty, not just beautiful, not just really cool. This is an 'Oh my!' kinda place.” Approaching the south rim of the canyon after leaving Montrose, Colorado, the road climbed up, then up some more. Having grown up in Colorado, this felt right, familiar. The air got a bit cooler, and the piñons and junipers closed in. The road narrowed as the entrance station emerged into view. Approaching the rim of the canyon, miles of trees and distant mountains, seemingly uninterrupted, stretched into the distance. Then, suddenly, “Oh my!” What is this? There at my feet a deep gash, a vertical cliff, cut into the landscape nearly 2,000 feet deep and less than a quarter-mile wide. Once my breath returned, I wondered what the early explorers thought when they stumbled across this obstacle. Did they also wonder what happened here? This is a land of dramatic and complicated geologic stories, sparse rains and thriving wildlife, a place where ephemeral pools of water hold creatures fascinating and mysterious. This is a land that pitted the ambitions of water engineers and train entrepreneurs against solid rock, rushing streams, and dizzying depths. 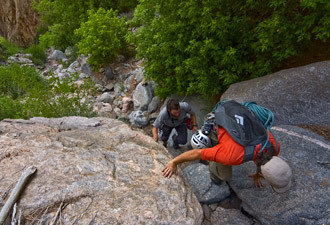 My colleagues and I help today's explorers who venture onto the hiking trails along the rims or gather their utmost adventuring skills to explore inner canyon routes or rock walls. 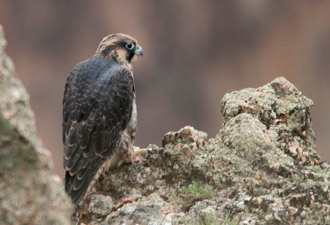 We create and present programs in the amphitheaters and at viewpoints along the rim. We talk with those visitors who are looking for depth of information to match the depths of the canyon, chat with them at the visitor center, and guide them to the books or games that might interest them in the bookstore. One of my favorite first evenings in the park I joined others in exploring the night around the campground. A ranger and local astronomy enthusiasts shared their knowledge with us as the Milky Way stretched across the sky and the roar of the Gunnison River floated up from far below in the canyon. These are the experiences that tie us, both rangers and visitors, to our national parks. Now that I've been here a while, I've internalized this place. I've come to realize that this park is unique because it is so vertical. 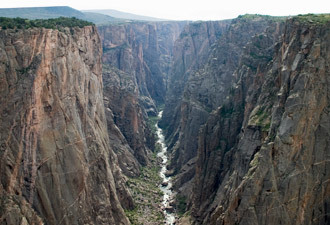 In essence, Black Canyon of the Gunnison National Park is a vertical landscape, a vertical wilderness — from canyon floor to dark skies.